Internet users around the world, but mostly in the US, reported that some top websites were not loading on Friday morning. The affected sites include Amazon, Twitter, Netflix, Etsy, Github, and Spotify. The issue is currently ongoing. It was mostly resolved at 9:20 a.m. ET, but at 12:07 p.m. ET, the issue started to crop up again, according to one of the companies at the center of the apparent cyber attack. At 4:16 p.m. ET, Dyn said that it was facing a third wave of attacks, CNBC reported. If your password is easy for you to remember, then it'll be easy for hackers, too. Try using symbols, numbers and capital letters throughout your passcode. Also, experts suggest you use different passwords for different accounts. Add another layer of security by having another code sent to your phone number before you can sign in. If you're traveling, verify with the coffee shop or hotel that the wi-fi name is valid -- many cybercriminals set up networks with similar names to popular spots. You can also set up a private VPN that encrypts all of your data that passes through the network. Wipe your hard drive clean before giving away, recycling or throwing out your old laptop or computer. That's just asking for trouble! Don't ever click on URL from an unidentified or sketchy looking email. FBI director James Comey suggests placing a piece of tape over your webcam when you're not using it. If that doesn't convince you, note that Mark Zuckerberg is known to do the same. Hackers target vulnerabilities in software, which are often resolved in software updates, so stop hitting the "ignore" or "remind me later" button! The issue appears to have something to do with DNS hosts — in particular, Dyn, one of the biggest DNS companies. Domain Name Servers are a core part of the internet's backbone. They translate what you type into your browser —www.businessinsider.com, for example — into IP addresses that computers can understand. Dyn said on Friday that it suffering a DDoS attack, or a distributed denial of service. That basically means hackers are overwhelming Dyn's servers with useless data and repeated load requests, preventing useful data — the Twitter IP address, for example — from getting through. 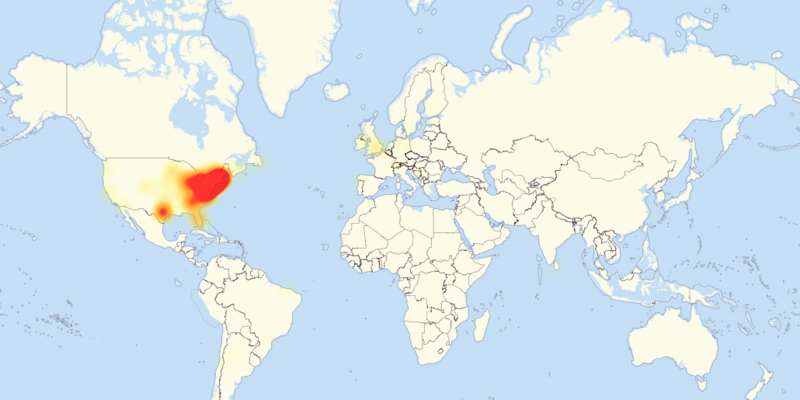 No group has taken credit for the DDoS attack yet. The Department of Homeland Security is monitoring the attack, Politico's Eric Geller reports. The FBI is also investigating, according to Reuters. The second round of attacks seems to effect the West Coast of the US and Europe as well. If you're having issues, some people online seem to think this walkthrough to use OpenDNS and Apple's support page can help mitigate the problems. Here's how the day has unfolded, according to Dyn, the company being attacked. "Starting at 11:10 UTC on October 21th-Friday 2016 we began monitoring and mitigating a DDoS attack against our Dyn Managed DNS infrastructure. Some customers may experience increased DNS query latency and delayed zone propagation during this time. Updates will be posted as information becomes available." 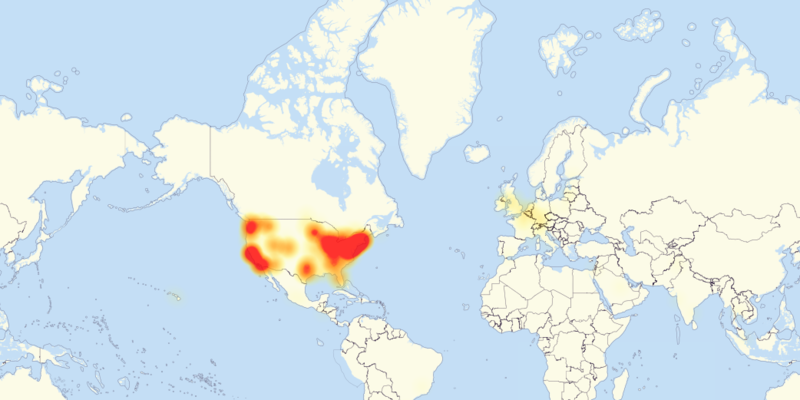 "This attack is mainly impacting US East and is impacting Managed DNS customer in this region. Our Engineers are continuing to work on mitigating this issue." "Services have been restored to normal as of 13:20 UTC." "As of 15:52 UTC, we have begun monitoring and mitigating a DDoS attack against our Dyn Managed DNS infrastructure. Our Engineers are continuing to work on mitigating this issue." "This DDoS attack may also be impacting Dyn Managed DNS advanced services with possible delays in monitoring. Our Engineers are continuing to work on mitigating this issue." "Our engineers continue to investigate and mitigate several attacks aimed against the Dyn Managed DNS infrastructure." "Dyn Managed DNS advanced service monitoring is currently experiencing issues. Customers may notice incorrect probe alerts on their advanced DNS services. Our engineers continue to monitor and investigate the issue." "At this time, the advanced service monitoring issue has been resolved. Our engineers are still investigating and mitigating the attacks on our infrastructure." "Our engineers are continuing to investigate and mitigate several attacks aimed against the Dyn Managed DNS infrastructure." CNBC reported that Amazon investigated the issue as well. "Amazon & DynDNS investigating internet outage reports on east coast of U.S. amid reports of major websites not working properly," it somehow tweeted. Earlier this month, the United States transferred its oversight of DNS to an international non-profit group, a move that had been more than 20 years in the making. "The incident has been resolved." CNBC reported that Amazon investigated the issue as well, although it eventually found the issue to be with the Dyn attack. "Amazon & DynDNS investigating internet outage reports on east coast of U.S. amid reports of major websites not working properly," it tweeted.